Then I saw a Lamb, looking as if it had been slain, standing in the centre of the throne, encircled by the four living creatures and the elders. He had seven horns and seven eyes, which are the seven spirits  of God sent out into all the earth. The figure of the Father, seated on the throne is the source of light in this scene. The Father, on the throne, the Lamb, on the Father’s knee. 01) (This page) Revelation 05 – The Scroll and the Lamb – Scene 04 – The Lamb (with blood). 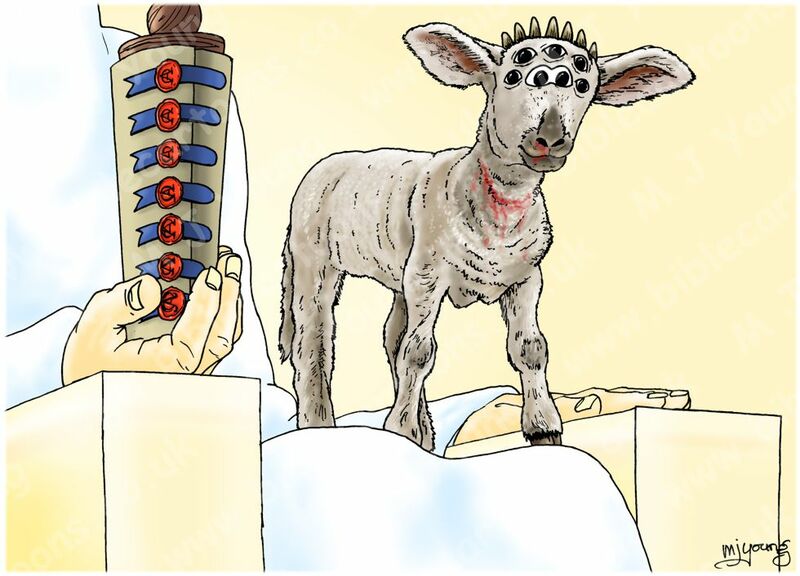 02) (Next page) Revelation 05 – The Scroll and the Lamb – Scene 04 – The Lamb (without blood). The only difference between the scenes is the blood in the first version. I include it because verse 6 states “…a Lamb, looking as if it had been slain”. The only way to show that sacrificial lamb’s state is with blood. I have included the 2nd version for viewers and customers who don’t want to use the scene with blood present. 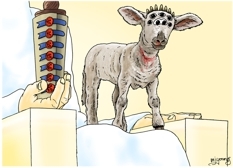 It was strange drawing a cute, fluffy lamb which has seven eyes and seven horns, but that’s the Bible description, so I had to illustrate it that way. I have used the intertwined Greek symbols for Alpha and Omega on the 7 red wax seals on the scroll. In Revelation 23:13 Jesus sates, “I am the Alpha and the Omega, the First and the Last, the Beginning and the End.” So it seemed appropriate to use these Greek symbols on the scroll seals. 5:6-7. Though introduced as a “Lion” (v. 5), what John saw was a Lamb that appeared to have been slain or sacrificed. Yet the Lamb was standing in the center of the throne. About Him were the 24 elders and the four living creatures. The Lamb had seven horns and seven eyes. The Lion and the Lamb surely refer to Christ, with the Lamb referring to His first coming and His death and the Lion referring to His second coming and His sovereign judgment of the world. This is the only place in Revelation where Christ is called a Lion, whereas the word “Lamb” (arnion, “a small or young lamb”) is found 27 times in Revelation and nowhere else in the New Testament. But two similar words for a sacrificial lamb are used in the New Testament: arēn, found only in Luke 10:3, and amnos, which occurs four times (John 1:29, 36; Acts 8:32; 1 Peter 1:19).